Industrial LCD manufacturer KOE has announced the introduction of a new 9.0-inch Rugged+ TFT display. The TX23D201VM0BAA display features IPS-Pro (in-plane switching), WVGA (800 x 480 pixels) resolution and a 15:9 wide aspect ratio. KOE's IPS Pro display technology delivers exceptional colour saturation and stability, high contrast and deep black levels with 170° wide viewing angles (vertical and horizontal). The 9.0-inch display features a contrast ratio of 800:1 and a white LED backlight with a brightness of 1000cd/m² and a specified 70K hour half-brightness lifetime. Display images are bright, colourful and concise. Mark Stephenson, Technical Marketing Manager, KOE Europe, commented, "Strong optical performance with wide viewing angles and consistent colour reproduction are key features of the new 9.0-inch TX23D201VM0BAA which implements the most recent version of IPS-Pro technology. Additionally, Rugged+ displays are designed to have robust mechanical characteristics that are highly resistant to shock, vibration and ESD (electro-static discharge)." A 20-pin LVDS interface supports 6-bit RGB and FRC (frame rate control) which enables a colour palette of up to 16.7M colours. The 9.0-inch display module has mechanical outline dimensions of 218mm (w) x 135.0mm (h) x 11.15mm (d). Support for harsh environments is enhanced with an operating temperature range of -30°C to +80°C and a storage temperature range of -40°C to +90°C. 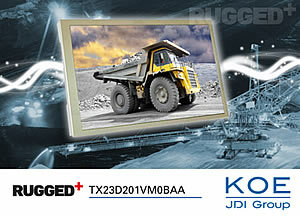 KOE's Rugged+ TFT display modules are targeted for use in high reliability industrial, medical, marine, automotive and aerospace applications where consistent and guaranteed operation under extreme temperature, mechanical shock and vibration is a necessity. For dedicated HMI (human-machine interface) applications the TX23D201VM0BPA is available with an integrated 4-wire analogue resistive touch-panel. The new TX23D201VM0BAA and TX23D201VM0BPA are available from Anglia Live.